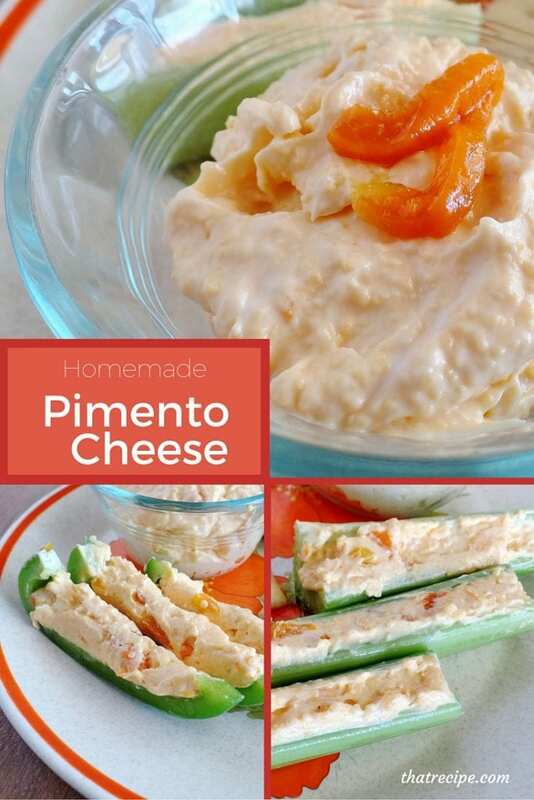 Before we jump into the Tasty Tuesdays Linky Party, I want to share a simple appetizer or sandwich spread depending on how you want to devour it: Pimento Cheese. Yes, you can buy this pre-made in the store for about $3 for a 5 ounce jar. Or you can whip it up for yourself and adjust the the amount of peppers and consistency to your preference. Southerners are going to look at this recipe in horror – cream cheese instead of mayonnaise?! YES! This makes it thicker and great for stuffing in celery or bell peppers or shaping into a ball (or a pumpkin shape for Halloween) for a simple appetizer served with crackers. Or thin it a bit more to use as a sandwich spread, or even more to make it a dip. You can thin it with milk, the juice from the peppers or mayonnaise depending on the flavoring you want. If you’d like to read more about the fascinating history of this spread, pop over to Serious Eats to learn how this dish has evolved from the marriage of two processed foods in the 1870’s to a Southern staple. Seriously, it was interesting and he did a lot of research! In case you are wondering why my pimentos are orange instead of read it is because I used my Homemade Roasted Peppers, which happened to be orange the last time I made them. Homemade Pimento Cheese - cheddar cheese with red bell peppers mixed in. Great on crackers or a sandwich or stuff in celery or bell peppers. In the Southern part of the United States mayonnaise is used instead of the cream cheese making this more like a dip. Substitute some or all of the cream cheese as desired. Mix cheeses and milk in food processor until smooth and spreadable but not too thin. Drain red peppers and save the liquid! Place the cheese mixture in a bowl and stir in peppers and about 1 tablespoon of the reserved liquid. Chill before serving. May be stored in refrigerator about one week to ten days. Dina from Savvy in the Kitchen, Maria from Maria Magdalena Living Ideas, Danielle from Creatively Homespun, Audrey from That Recipe, and Ashley from Forgetful Momma are our co-hosts for October. Mmm This cheese spread looks like the perfect spread. And it’s so easy to make homemade. Pinning for later. Thanks. Hope you like it, thanks for coming by. Pimentos are nothing more than roasted red peppers, but most people don’t know that. Your recipes always look so delicious! Pinning! As always, it’s nice to be co-hosting this week’s #HomeMattersParty with you! The celery is my GodDaddy’s favorite!